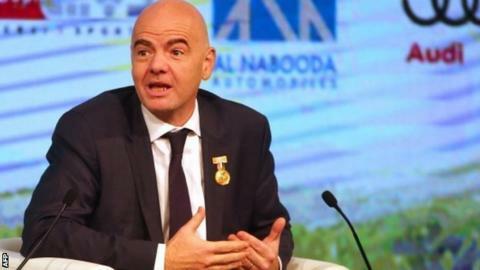 Fifa presidential candidate Gianni Infantino says he would press for the World Cup to be held in a whole region rather than one or two countries. The Uefa general secretary has included the plan in his manifesto for the Fifa election on 26 February. His idea follows European football's governing body Uefa's decision to play Euro 2020 in 13 different countries. "Each confederation shall have to wait at least two editions before being able to host the World Cup again," he said. "This will ensure a more equitable rotation, while giving every confederation the opportunity to organise this unique event. "Furthermore, Fifa should investigate the possibility of organising the World Cup not only in one or two countries but in a whole region, so enabling several countries to enjoy the honour and benefits of hosting the World Cup." Infantino is one of five candidates standing for the presidency of world football's governing body, which is in crisis following a series of corruption claims. He is up against Sheikh Salman bin Ebrahim Al Khalifa, the Bahraini head of the Asian football confederation (AFC), Prince Ali Bin Al Hussein of Jordan, South Africa's Tokyo Sexwale and Jerome Champagne, a former Fifa deputy secretary general from France. Current Fifa president Sepp Blatter has been banned for eight years from all football-related activities for breaching ethics rules.